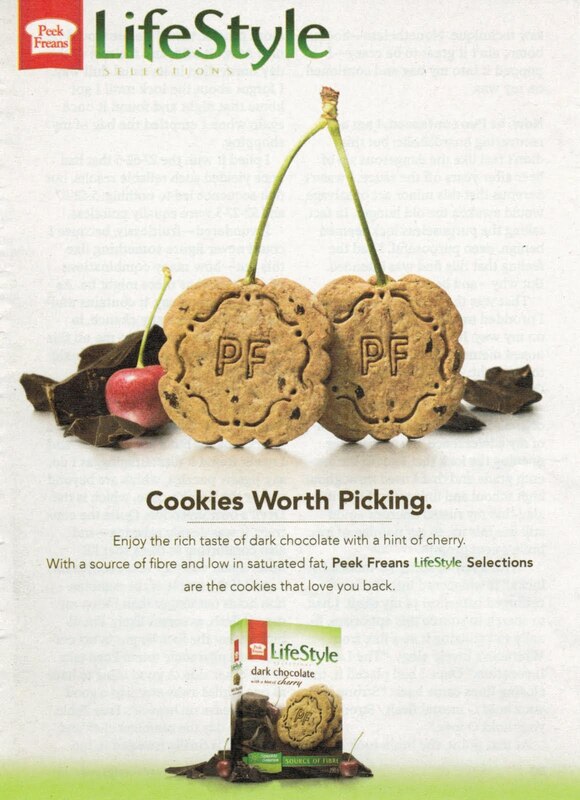 Weighty Matters: Badvertising: Peek Freens Lifestyle Selections - nutritionism in action. Badvertising: Peek Freens Lifestyle Selections - nutritionism in action. Food and product manufacturers in Canada are likely jumping for joy as a consequence of Health Canada's new 5-15 percent daily value campaign. Because campaigns like 5-15 percent daily value promote nutritionism - the notion that specific nutrients in foods dictate their health benefits and permit you to ignore the food's remaining ingredients. Peek Freens Lifestyle Selections are a great example of nutritionism in action. Simply put, they're cookies with a nutritionism bend. The one up above? It has "fibre". Other Peek Freen "lifestyle selections" boast the inclusion of, omega 3, green tea, calcium and prebiotics. Ultimately though, they're just cookies, and cookies, no matter how they crumble, aren't healthy. Doesn't mean you can't have one from time to time, but please bear it in mind - they're freeking cookies.